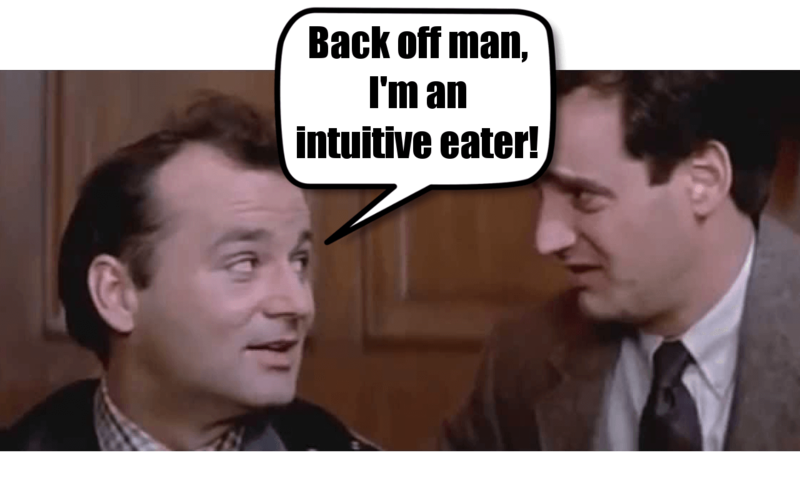 Back Off Man, I’m an Intuitive Eater! I have a weird relationship with apple pie. It smells great when it’s fresh out of the oven, but it doesn’t taste as good as it smells.1 I kindly tell people this when they offer me a slice. Most look at me like I’m bonkers and bewilderedly shake their heads before moving on. Every now and then I’ll come across someone who insists that I eat the pie. I politely yet firmly refuse again. Most take the hint, but some keep urging me to eat. I hate being in this predicament because I don’t want to eat the pie, but I also don’t want to be completely rude to my host. So what’s a girl to do? Being social means that food will often be present in some form or another. Food brings people together. We share meals and celebrate holidays with a feast. People also often use food an excuse to catch up with friends. We both need to eat and haven’t seen each other in a few months, so let’s do lunch! Prior to discovering intuitive eating, I would feel obligated to eat food at social gatherings. If I were offered food, I felt refusing would be rude, so I would accept the food and eat it despite not being hungry. In middle school, I remember visiting a friend across the street and her mother asked me if I wanted anything to drink. I wasn’t thirsty, so I politely declined. It fell on deaf ears. She promptly poured me a huge glass of milk and placed it in front of me.2 I stared at the milk for a moment, not wanting to drink it, but I drank it anyway. My stomach became bloated, and, honestly, there was some resentment towards my friend’s mother for making me feel obligated to drink the milk. One of the lessons intuitive eating taught me was to be more assertive so I could better meet my needs. Early on when I was offered food, I would simply say, “No, thank you”, but sometimes that didn’t get the job done. Now I say, “No thank you. I’m not hungry,” and the addition of “I’m not hungry” seems to help. Most people don’t insist on forcing food on me at that point. I think it has to do with the idea that a lack of hunger is different than a lack of desire to eat the offered food. It’s understood that I’m not shunning the meal; I just lack hunger at the moment. Everyone has experienced the feeling of not being hungry, so they get where I’m coming from. Did you notice how I used the word “most” when saying that most people don’t insist on forcing food on me? That’s because there are people who simply don’t take “no” for an answer. These situations used to bring about great internal conflict for me because I was trying my best to eat intuitively, but the host’s insistence made me feel like I was the one being rude. I would put the host’s feelings before my own needs and take the food, eat it, and feel awful. Not only was I uncomfortably full, but I was disappointed that I was not able to stand up for myself. As I’ve gotten older, I’ve learned that my needs should have a priority in my life. Intuitive eating helped me grasp the fact that meeting my basic biological and emotional needs should be an important part of my day. Once I realized that putting myself first for a change was a form of self-care, I decided to hold firm about not accepting food if it was thrust up on me at the next social gathering. I didn’t want to have to think on my toes when the situation came up, so I brainstormed ways to put my plan into action. It did cross my mind to simply tell a white lie and say that I had some sort of food sensitivity, but I realized that that would just open a whole new can of worms about my health. Scratch that of my list! I could also smile and do my own thing. This one might not go over so well though. I would feel quite awkward sitting there with a plate of food and not eating as an act of rebellion. That idea wouldn’t work either! I eventually came up with a response that was a definite possibility. I decided I would express how appreciative I was of being offered food. I would acknowledge my host’s generosity and the desire to provide me with nourishment. I could then explain that my body is comfortable right now and eating any more would make my body feel uncomfortable. I would conclude with over-the-top praise about how delicious the food was and even suggest putting together a plate of food to-go so I could enjoy it later. That seemed totally do-able! I had to put it into practice a few weeks later at a 4th of July celebration. My neighbor is the nicest guy. This man loves food and wants to share his love of food with others, so he always cooks more than what is needed for his parties. I went to the party fully expecting to be offered a second helping after I finished what was on my plate. And sure enough, that was exactly what happened! I had mentally rehearsed what I would say to him, so I felt prepared. I took a deep breath, gathered my inner strength, and put my plan into action…and it worked! He was quite pleased that I had enjoyed the food and wanted to take some home. I realized he really just wanted validation for his cooking. It know it was win-win because I felt like I advocated for myself and his smile after I praised his food was priceless. I learned that it’s important that I set boundaries. As I familiarized myself with the art of saying “no”, I began to feel more empowered. I’m not saying that I will ignore my host’s feelings, but ultimately I am the one who is in charge of what I put into my body. I may need to explain a little more about why I don’t want any more food or even be extra complimentary about the meal, but that’s okay. If I expect my host to respect my wishes and back off a bit,3 then the least I can do is show some patience and tact. When I approach situations from this angle, the experience becomes much more pleasant for everyone. How do you respond when someone insists on giving you food? Please share in the comment section below. 1I’m not sure if it’s the crust to apple ratio or the texture of the apples, but it just doesn’t do it for me. 3The original Ghostbusters and Dr. Peter Venkman’s “Back off man, I’m a scientist” immediately pops into my head. Thanks Deborah I enjoyed that and has given me the encouragement to do the same. It’s one of my fears when I go to visit someone that I get force fed and I’m not too good at saying no thanks . I think speaking up is really hard, so I’m glad that you are encouraged by my writing. After you do speak up for yourself, it will get easier with time.